For many the allure of the mountains is so great, that one or two week’s holiday a year is just not enough. If this sounds like you, why not move to the mountains for the winter? 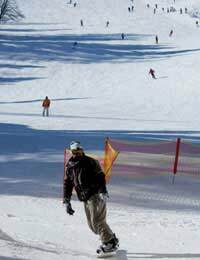 Every season, thousands of people head for the hills to enjoy a winter of powder and partying. Many ski resort workers are gap year students or recent university graduates, but an increasingly large number of older career breakers are also discovering the joys of living and working in a ski resort. For those living in the UK – Europe is the easiest place to head. Those with a British passport can work anywhere in the EU, which opens up a huge range of possible locations: the French Alps, the Spanish Pyrenees the Italian Dolomites, Slovakian Tatras, Norwegian Hallindal Valley – the choice is large and diverse. Most Brits tend to head for France and Austria – as this is where the major UK ski companies base their operations, and therefore provide plenty of opportunity for employment. More and more are also venturing further a field to North America, though a visa is needed, meaning this takes a little more organisation. Those who chase the endless winter will head down under to New Zealand or Australia after the Northern Hemisphere’s winter has ended. Really adventurous snowboarders are opting for places like Argentina and Japan, which can offer amazing cultural experiences in addition to the snow, but will need more organisation and planning than other destinations. When choosing a resort to spend the season in, think about want you want. Do you like partying more than powder? Are you a terrain park monkey, or a backcountry bandit? Choose a resort that suits your lifestyle. Like in any town, there are a number of possible jobs to do in a ski resort. However, many “seasonaires” pick up work as chalet cooks and hosts or hotel workers. These have the advantage that they normally provide accommodation and there are many British companies which hire in the UK, so you can secure your job before you arrive. Check with the employer to see what’s included with your job. Some will offer free or discounted accommodation and a season lift pass and sometimes free food and cheap equipment . It’s important to take the perks into account when picking a job. Other possible resort jobs include a waitress, bar tender, ski technician, kitchen porter, handyman or shop assistant, and if you have the right qualifications you may be able to instruct skiing or snowboarding. Each job has its pros and cons in terms of pay rate, hours and perks, so do your reseach before you apply. Though it’s possible to turn up mid season and land a job, the best plan of action is to either apply in late summer, or arrive at a resort in late autumn to start looking. This way you’ll get the best pick of the jobs and get sorted early. Though working in a ski resort may sound like the best job in the world, be aware that it can often be stressful and exhausting. Many of the jobs require you to work six days a week, (though they often allow some time off during the day). You may also need to get up early and you’ll have to accept that often you’ll miss out on fresh powder because you’ve got to work. In addition, many seasonal jobs are fairly low paid and ski resorts are expensive places to live, so you’ll have to be careful with your money. Ski resorts are also renowned for being party places, so expect lots of late nights and hung over mornings. However, with this being said, most people who work a winter season have an amazing and sometimes life changing experience, and many go back for more.